This model has been curated and is known to run in OpenCell and COR to produce the results (figure 6) described in the publication. The units have been checked and they are consistent. ABSTRACT: Prolactin (PRL) is secreted from lactotrophs of the anterior pituitary gland of rats in a unique pattern in response to uterine cervical stimulation (CS) during mating. Surges of PRL secretion occur in response to relief from hypothalamic dopaminergic inhibition and stimulation by hypothalamic releasing neurohormones. In this study, we characterized the role of oxytocin (OT) in this system and the involvement of vasoactive intestinal polypeptide (VIP) from the suprachiasmatic nucleus (SCN) in controlling OT and PRL secretion of CS rats. The effect of OT on PRL secretion was demonstrated in cultured lactotrophs showing simultaneous enhanced secretion rate and increased intracellular Ca(2+). Neurosecretory OT cells of the hypothalamic paraventricular nucleus that express VIP receptors were identified by using immunocytochemical techniques in combination with the retrogradely transported neuronal tracer Fluoro-Gold (iv injected). OT measurements of serial blood samples obtained from ovariectomized (OVX) CS rats displayed a prominent increase at the time of the afternoon PRL peak. The injection of VIP antisense oligonucleotides into the SCN abolished the afternoon increase of OT and PRL in CS-OVX animals. These findings suggest that VIP from the SCN contributes to the regulation of OT and PRL secretion in CS rats. We propose that in CS rats the regulatory mechanism(s) for PRL secretion comprise coordinated action of neuroendocrine dopaminergic and OT cells, both governed by the daily rhythm of VIP-ergic output from the SCN. This hypothesis is illustrated with a mathematical model. In the paper described here, Egli et al. present a mathematical model of the mechanisms regulating the rhythmic secretion of prolactin in rats (see figure below). In this model the SCN acts as a pacemaker, controlling the activity of the hypothalamic DA and OT neurons via its rhythmic VIP secretion. 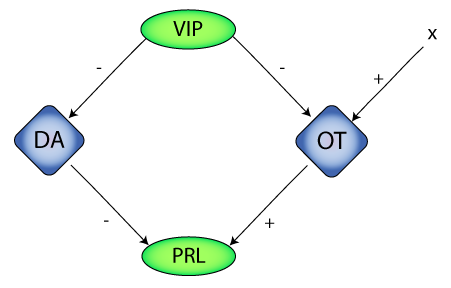 In turn, the activity of these DA and OT neurons combine to determine the PRL secretory pattern. Schematic diagram of the network proposed to be involved in the regulation of prolactin (PRL) secretion in response to uterine cervical stimulation (CS). Vasoactive intestinal polypeptide (VIP) is secreted from the suprachiasmatic nucleus and relays the time of day to DAergic and OTergic neurosecretory cells via inhibition. x represents an additional stimulatory input which feeds into the OT neurons. DA neurons provide an inhibitory input while OT neurons provide a stimulatory input to the lactotrophs to regulate the synthesis and secretion of PRL. The authors highlight that the original code they wrote for this model can be downloaded here. Derived from workspace Egli, Bertram, Sellix, Freeman, 2004 at changeset 47e86468f8af.